After weeks of driver speculations, unveiling of ugly noses and crash tests, the 2012 season is finally here. Well, almost. Pre-season Jerez & Barcelona Testing is also done and now everyone’s waiting for the real deal. While the teams are packing bags to fly to Melbourne for the the first race of 2012, The Aerodynamics Project caught up with Sahara Force India drivers Paul Di Resta & Nico Hulkenberg and asked them about a Spanish city, ugly noses and 3 teenagers, among many things. Motorsport World: Last season Sahara Force India finished and this year the team is looking forward to finishing in top 5. Supposing Ferrari, McLaren & RBR takes the top 3 places in any order; SFI will be required to beat at least one of the Mercedes or Lotus, and given that both these teams have a World Champion, Schumi & Kimi, does that put any pressure on you? Paul: Not at all. Of course, they’re World Champions and it is difficult but at the end of the day, they all are competitors & I’d want to beat them all. I’m not intimidated. Last year we the team performed really well and we actually punched above our weight and managed to secure 6th place.This year our goal is to do better than last year and get in top 5. Having said that, it’s going to be a difficult task just to hold on to P6. Motorsport World: Due to the changes in FIA regulations, the nose cone design has been changed this year and all the teams except McLaren has opted for crooked-nose design. Would you have also preferred the smooth lines of VJM05 like that on McLaren instead of the crooked-nose? Paul: I’d be slightly worried if I were McLaren, since it’s 11 against 1 as far as the nose design is concerned. And 11 opinions can’t be wrong. Motorsport World: FIA has made certain changes in technical specifications due to which there have been few changes in design most notable of which have been the changes in exhaust and the nose cone. How much have these changes affected the down force, handling and balance of the car compared to last year? Nico: If you see VJM04 & 05, it’s not night and day. There isn’t much difference in the performance. It’s still very similar, so you’ll see a very similar car in terms of performance. Motorsport World: What kind of training you went through in order to get yourself back in a state that would enable you to race during the weekends, like in 2010? Nico: Well training started in January and we did lots of simulator & workout training. I’ve been off racing since 14-15 months and hence I needed to get down to that same fitness level of racing on weekends once again. Motorsport World: Barcelona Testing is done, you’ve got the feel of the car and everything. What are your first thoughts about the car? Do you think VJM05 is good enough to fight for the podiums? Nico: If we have slightest advantage, slightest of chance, we will surely fight for it (podium). May be during a wet race when there will be confusion for the strategy or maybe under the safety car if we might get in front, then we can have a good chance. Otherwise, it’ll be very difficult. Motorsport World: The whole field is divided in long and old drivers. On one hand, there are drivers like Schumacher & Kimi who are elder and much experienced, which at the other hand, there are young and relatively less experienced drivers like you, Vettel, Hamilton & others. Does that put any sort of pressure on the younger lot, like you? Nico: No. In fact, this shows the kind of talent that we have in the field. Though they’re experienced, still if we can beat them, it’s great for us. Motorsport World: Last time when I met you, you were judging FIDA – Force India Driver’s Academy’s One From a Billion Hunt’s contestant. It’s been about 6 months since the winners have been announced and you must have seen their progress. Do you honestly think that any of them have the potential to step in your shoes and be a Formula One driver, 7 years from now? Nico: Yes, I certainly think those 3 kids have full potential. Currently, I think they’re racing in Italy and given the right engine & setup, and training over the years, they’ll certainly do great. And like you said, 7-8 years down the line, they certainly have the potential to drive the Sahara Force India car someday. 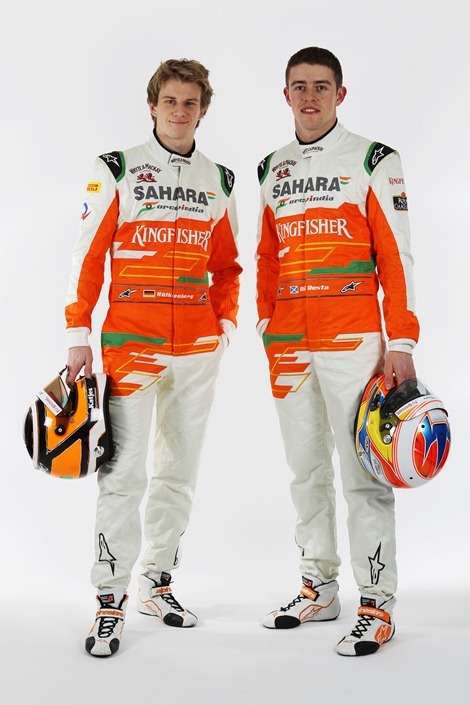 Whether SFI can actually be one of the top 5 team remains to be seen, we certainly hope that Nico & Paul have a great 2012 season, and we wish them and the whole team good luck!